In this image, taken a few days after 9/11 (and before the cleanup began), a row of massive box columns, major supporting structure of the WTC towers, can be seen extending from the right foreground into the left background. Each column has been cut with a high-intensity incendiary compound, in all likelihood, thermate. Each cut is diagonal to facilitate the lateral dislocation of the upper member, guaranteeing its orderly collapse. This is a standard procedure for the more modest cutting charges used in regular demolition work) Without the application of such techniques, no â€œpancakingâ€ of floors would have been possible, given the immense vertical strength of the columns. This remarkable transformation (left image) of Ousama bin Laden (right image) occurred on December 13, 2001 as part of a videotape that was one of several released to the media over the years since 9/11. Either he had been compressed vertically by some awesome force, then baked in an oven for an hour — or the image on the left is not bin Laden. The conclusion being obvious, it is sad to realize how easily this duplicity passed through media hands with nary a whisper of suspicion. In the end, it becomes a question of incompetence, compliance or complicity. It strains credulity to think that such a large collection of professional people could have attained such a degree of collective stupidity. 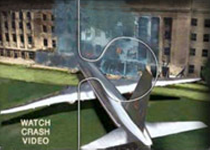 The damaged engine shown in the image on the left was among the crash debris found at the Pentagon. It happens to match the engine shown on the right, a JT8D engine manufactured by Pratt & Whitney, except the damaged engine has lost its rotor blades. The JT8D is apparently used in the A3 Skywarrior, among other aircraft. However, the JT8D is NOT used on heavier aircraft like the Boeing 700-series passenger jets, as it is much too small to be an effective power plant for such aircraft. It follows that, whatever aircraft struck the Pentagon, it was not a Boeing 767, as claimed by the White House on September 11, 2001. A ground zero witness has some interesting description of events – he describes floors explosions happening along building height toward bottom during collapse and just before.